The Elder Scrolls V: Skyrim (typically simply Skyrim) is an action role-playing open world video game developed by Bethesda Game Studios and published by Bethesda Softworks. It is the fifth installment in The Elder Scrolls action role-playing video game series, following The Elder Scrolls IV: Oblivion. 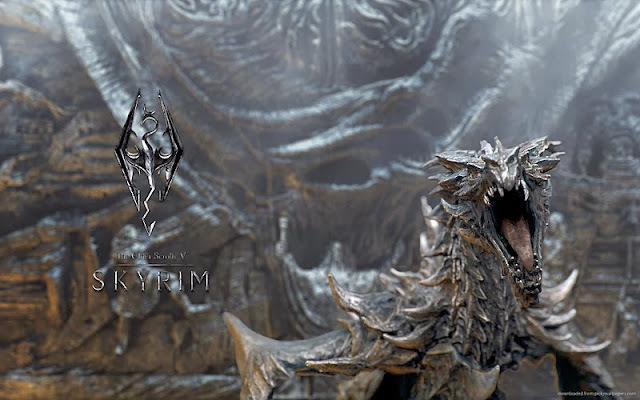 Skyrim's main story revolves around the player character's efforts to defeat Alduin, the firstborn of Tamriel's primary deity Akatosh. Alduin is prophesied to destroy the world. 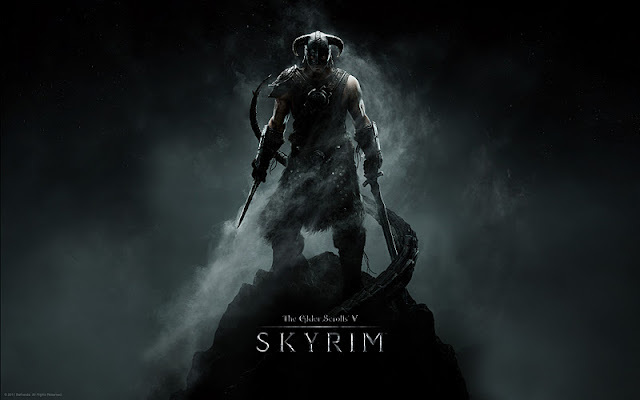 Set two hundred years after Oblivion, the game takes place in the land of Skyrim, which is in the midst of a civil war after the High King fell in a fair duel against the leader of the Stormcloaks. 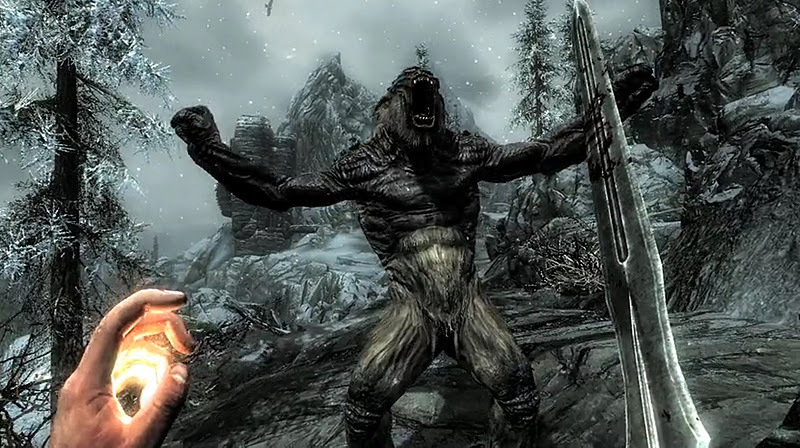 The open world gameplay of the Elder Scrolls series returns in Skyrim; the player can explore the land at will and ignore or postpone the main quest indefinitely. And you kill them by shouting! FUS RO DAH!!!! The nonlinear gameplay traditional in the Elder Scrolls series is incorporated in Skyrim. 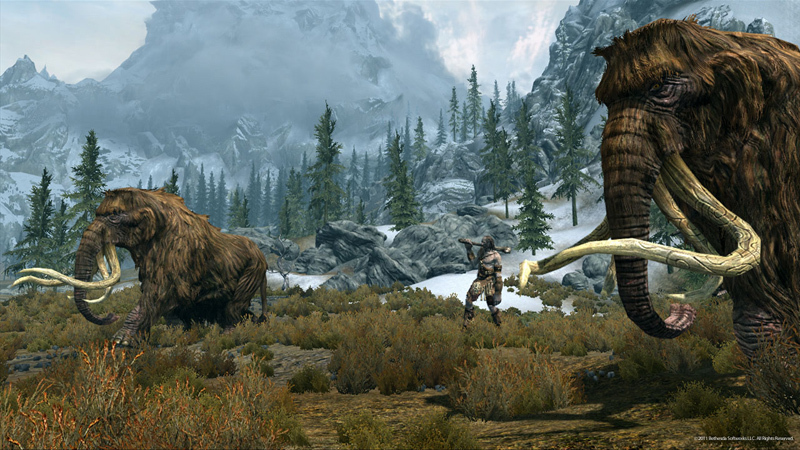 The player can explore the open world of Skyrim on foot or on horse, and fast-travel to cities, towns, and dungeons after they have been discovered. Quests are given to the player by non-player characters (NPCs) in the world, and through the Radiant Story system, the quests can be dynamically altered to accommodate for player actions which may influence the quest's characters and objectives. The Radiant Story then further directs the player's interaction with the world by setting unexplored dungeons as quest locations. When not completing quests, the player can interact with NPCs through conversation, and they may request favors or training in skills from the player. In addition to scripted quests certain ones will be dynamically generated, providing a limitless number to the player. Some NPCs can become companions to the player to aid in combat. The player may choose to join factions, which are organized groups of NPCs such as the Dark Brotherhood, a band of assassins. Each of the factions has a headquarters, and they have their own quest paths which the player can progress through. The economy of cities and towns can be stimulated by completing jobs such as farming and mining, or harmed by sabotaging industrial buildings. You can dual wield weapon, magic, or equip them separately. One of many creatures that you can kill. 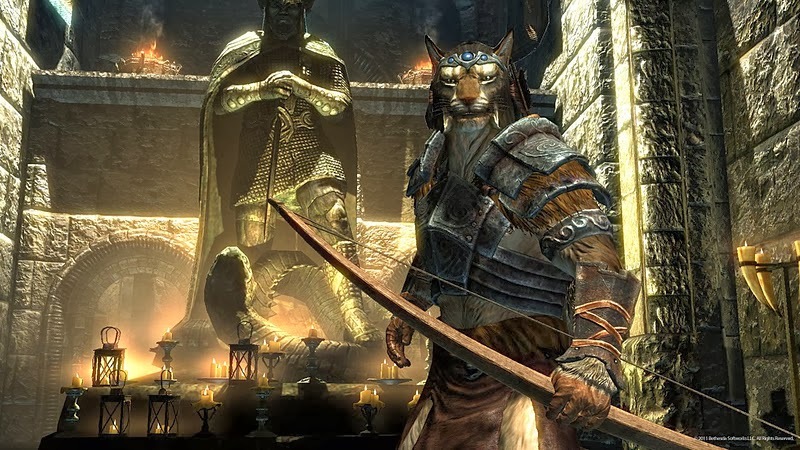 You can choose your own races, the human, orcs, elves, lizardmen and even cat! 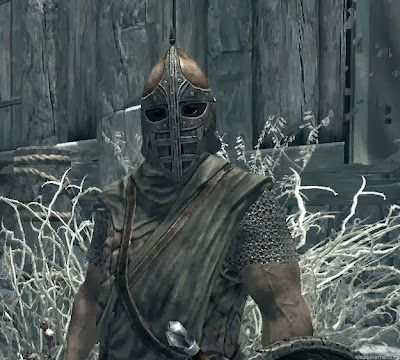 Character development is a primary element of Skyrim. 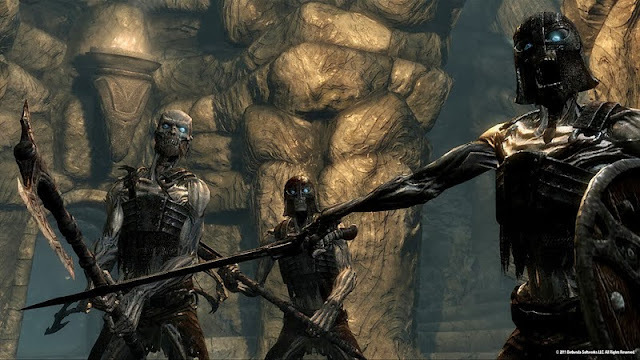 At the beginning of the game, the player selects one of several human, elven, or zoomorphic human races, each of which has different natural abilities, and customizes their character's appearance. A perpetual objective for the player is to improve their character's skills, which are numerical representations of their ability in certain areas. There are eighteen skills divided evenly between the three schools of combat, magic and stealth. Training skills until the necessary required experience is met results in the player's character leveling-up. 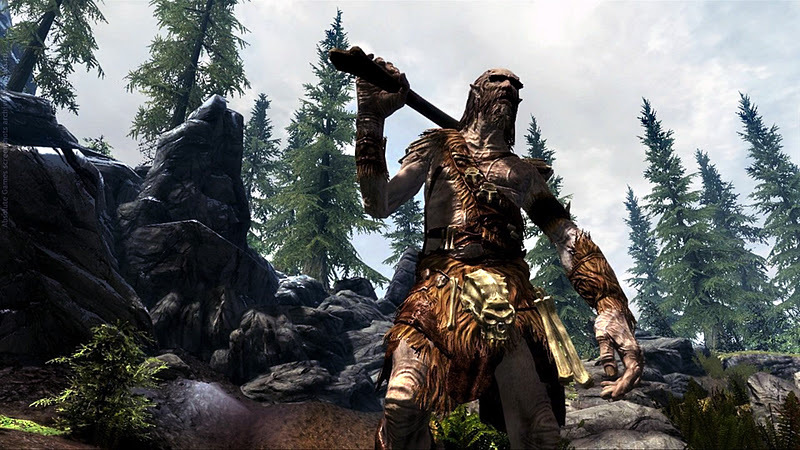 Previous Elder Scrolls games made use of a class system to determine which skills would contribute to the character's leveling, but its removal in Skyrim allows for a preferred play-style to be developed naturally. When their character levels, the player may choose to select a skill-specific ability called a perk, or store perks for later use. Upon levelling fifty times, the player character can continue to level and earn perks, but the rate of levelling is slowed significantly. A heads-up display appears when any one of the player's three attributes are being depleted. Health is depleted primarily through combat and can be restored by spells, potions, or resting; the loss of all health results in death. Magicka allows for and is depleted by the use of spells; it is regenerated naturally over time, but it can be restored in similar ways to health. 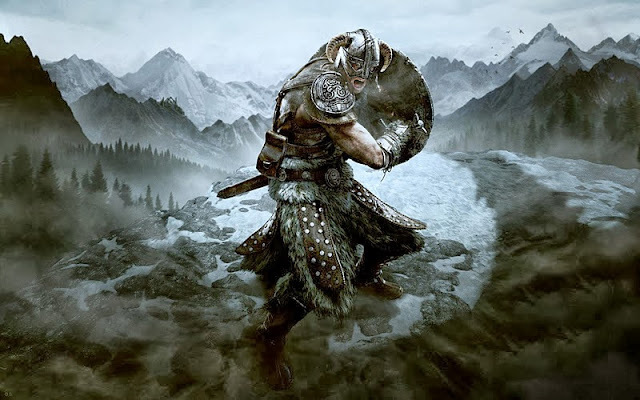 Stamina determines the player's effectiveness in combat and is depleted by sprinting, jumping, and power attacking, but can be restored in similar ways to health and magicka. The player's inventory can be accessed from the menu and items can be viewed in 3D, which may be essential in solving puzzles found in dungeons. The player's effectiveness in combat relies on the use of weapons and armor, which may be bought or created at forges, and magic, which may also be bought or unlocked. Weapons and magic are assigned to each hand, allowing for dual-wielding, and can be swapped out through a quick-access menu of favorite items. Shields can be used either to fend off enemy attacks and reduce the damage intake, or offensively through bashing attacks. Blunt, bladed and hacking weapons can be used in close combat and each have specific advantages and roles; as an example, the player can perform power attacks with each weapon. Magic can be used in the form of spells; each of the eighty-five spells has a different function, such as the regeneration of health or the depletion of enemy health. 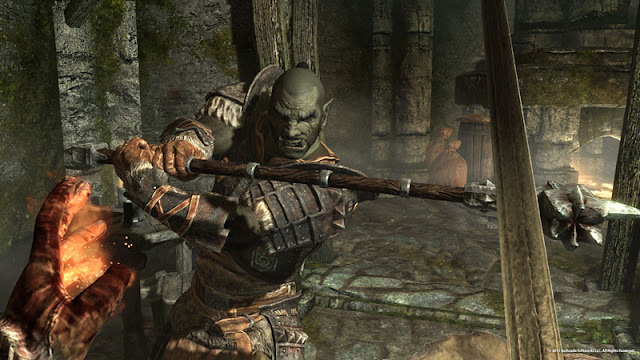 The bow and arrow may be utilized in long-range combat, but the bow can be used as a defensive melee weapon in close combat. The player can enter a sneak mode and pickpocket, or deliver sneak attacks to unsuspecting enemies. If the player drops unwanted loot, such as a shield or item of clothing, some NPCs will attempt to pick the item up, some even asking the player's permission to take the item. Seriously, don't mess with the giants. When exploring the game world, the player may encounter wildlife. Many wilderness monsters are immediately hostile towards the player and thus can be slain. 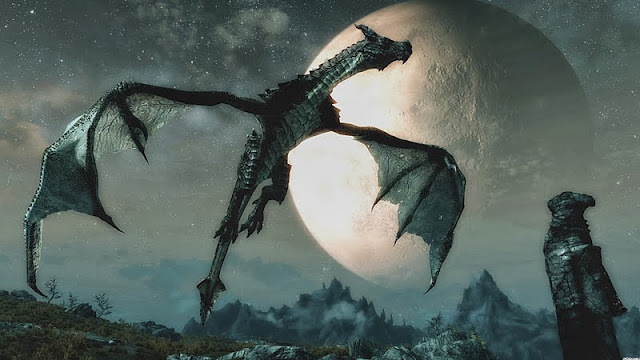 The inclusion of Dragons in Skyrimaffords a major influence on both story and gameplay. 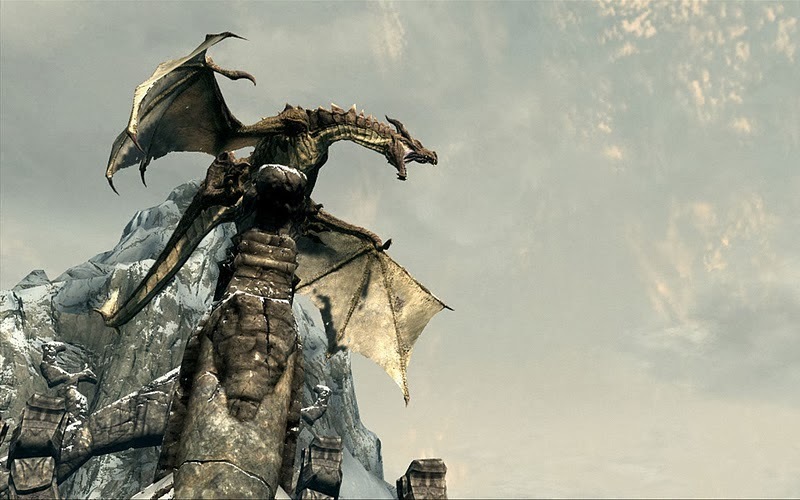 During the game's development, a team was set aside to work on Dragons and their interactions with the world. In the world, a variety of different Dragons are encountered either alone or in small groups. They are randomly-generated, meaning their numbers are infinite, and they can attack cities and towns at any time. 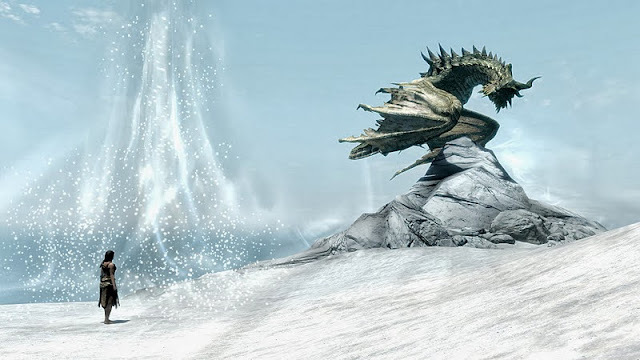 Not every Dragon is hostile, and the player can interact with non-hostile Dragons. 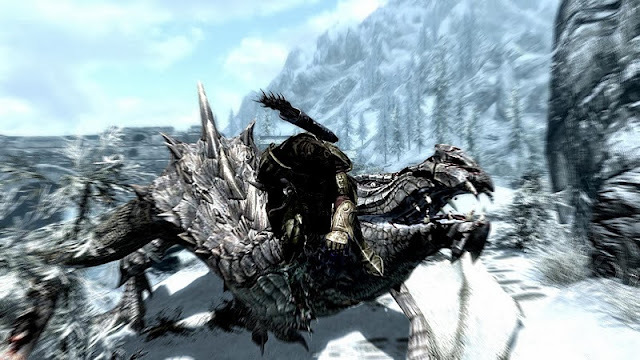 Early in the main quest, it is discovered that the player character is Dragonborn, which allows the player to use powerful spells called dragon shouts. Twenty different Dragon shouts can be discovered by visiting "Word-Walls" in dungeons, and they are unlocked for use by absorbing the souls of slain Dragons. A regeneration period limits the player's use of shouts in gameplay. Another significant change from previous games in the series is the elimination of weapon and armor durability; in which a player would periodically have to repair or pay to have items repaired or risk rendering them broken and unusable. OTAKU CLUB 2011 ANIME AND GAMES AWARDS! A Miku-miku christmas gallery 2! A Miku-miku christmas gallery 1!